What is going on within the CNDP, only last year the strongest rebel group in the region? A few days ago, the head of the CNDP, Desire Kamanzi, resigned, leaving a leadership vacuum at the head of the movement/party/ex-rebel group. But the vacuum was to a large degree there already. Kamanzi's sidekick and spokesperson for the party, Jean Munyampenda, had quit several months before, and it has been obvious pretty much since Nkunda's arrest that the party has been riven with internal conflicts and political dissent. Let's revisit the group's recent history. When Nkunda was arrested in January 2009, he was replaced by Bosco Ntaganda as the military leader of the CNDP. 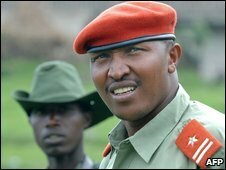 According to several CNDP officers, General James Kabarebe, the Chief of Staff of the Rwandan army, invited their officer corps across the border to Gisenyi to give them a choice: follow Bosco Ntaganda and integrate into the Congolese army or we will consider you as our enemies. Bosco was not popular amongst many in the officer corps for various reasons. Many did not appreciate Rwanda's domineering attitude, imposing their will on them and dictating the terms. Bosco was not charismatic or an intellectual, and he is from the Gogwe Tutsi clan from Masisi, whereas Nkunda is Jomba from Rutshuru territory. He is also a latecomer to the CNDP rebellion, having joined them from Ituri long after the CNDP was created. So the officers toed the line grudgingly, but with little enthusiasm. They continued to talk to Nkunda, who was under a loose house arrest in Gisenyi and then in Kigali, and they paid little heed to Bosco. Colonel Sultani Makenga became the figurative leader of these pro-Nkunda CNDP commanders, and only a few major commanders (Colonel Baudouin, Colonel Wilson Nsengiyumva) remained in the Bosco camp. In order to bolster his marginal position, Bosco affiliated himself with former Hutu governor Eugene Serufuli, which only further alienated him from the Nkunda faction. Tensions reached a breaking point in June 2009, when a scuffle broke out in Goma over disputed revenues from the timber trade. On both sides, the ex-CNDP commanders have fared relatively well - Bosco has solidified his control of the administrative apparatus in parts of Masisi territory, which provides him hundreds of thousands of dollars in tax revenues a month from the charcoal, timber and other trade. Makenga and other officers have, on their part, been able to establish over other lucrative rackets, often in collaboration with their former foes in the Congolese army. According to numerous reports, CNDP officers have brought thousands of cows across the border from Rwanda to the lush highlands around Mushaki, Ngungu, Kitchanga and Kilolirwe (all in Masisi), where they graze under the watchful eyes of CNDP soldiers. But, despite the fact that most CNDP officers are making more money than ever before off the various taxation rackets, parts of their movements are not happy. The politicians, on one side, have not reaped any benefits from the peace process other than the nomination of two minor ministers to the provincial government. In addition, many in the Tutsi community - their main constituency - feel that they core demands of refugee repatriation and protection of the Tutsi community have not been addressed (although around 12,000 "refugees" have returned from Rwanda this year.) The Amani process, the political negotiations through which all the rebel groups were pushing their demands, ended earlier this year. There is no formal framework through which the CNDP can now pursue its political ambitions. On the other side is Bosco himself, who has a an ICC warrant on his head and has few loyal friends left. Integration into the Congolese army seems to be a recipe for getting himself arrested eventually. In between all these various factions is the Rwandan government, which played a key role in the early months of the year only to take a step back and let the CNDP bicker amongst each other. It is instructive that Kigali, initially so forceful and controlling in January 2009, has not intervened to prevent officers from rejecting Bosco's authority. It seems that they are happy seeing a weak, factionalized CNDP. Now, in the past few weeks, Bosco has tried to reconcile himself with the Nkunda faction. There have been several meetings between Bosco and pro-Nkunda CNDP leaders to try to hammer out an agreement over the way forward. At the same time, there have been persistent reports regarding new recruitment being organized by Bosco with relatives in Kampala (a certain Ngabo Gad), although it seems that, if anything, Bosco wants to protect his own neck and not launch a new rebellion - the risks are too high. Just this week, the non-CNDP factions within the Congolese army have stepped up operations along the Ugandan border where Bosco was allegedly mobilizing troops. The CNDP negotiations appear to have broken down this week, as heavyweight CNDP commanders like Colonel Makenga refused to be part of any new rebellion. So the status quo of petty squabbles, internecine plotting and leadership conflicts will continue within the CNDP. It appears to appeal to the strongest parties - Kigali, the main CNDP commanders, and the Congolese government. The other parties - Bosco, the ex-CNDP politicians - have been cut out but have little recourse for the moment. It is a sort of willed disorder, what Congolese sometimes term as la politique de la pagaille. Sometimes everybody is best served by a mess. Hi Jason. Like your blog. quite insightful your analysis on what is happening in Eastern Congo. Do you think that what you have termed as politique de la pagaille is a deliberate creation of the Congolese leaders? Or it is just a result of the general disorder that characterizes the Congo. Secondly, is there a chance that the pro-nkunda faction may relaunch a rebellion in the future and to what extent can this be successful. Will be waiting for your answers. I am impressed at what you wrote. I will be following up more to get a better and impartial understanding from your educated analysis. My immediate response to your comments is based on the Congolese leadership. It seems as though the Congolese are side stepping their responsibilities and hence the Rwandan influence is dominating the politics? Where is the Provincial Governor in all of this? Surely he should be the one setting the tempo? Do you have any comments on this? Thank you very much for your posts, they are very insightful and informative! The analysis is much appreciated! 1. On the politique de la pagaille - it is both a deliberate strategy as well as a product of the historical context. Political leaders since Mobutu have been afraid of strong state institutions that could challenge their authority and pitting various local factions against each other to further this weakness. Joseph Kabila is well known for working "dans l'informel" and setting up parallel command structures, which sometimes have the same effect. 2. I don't think there will be a full-fledged new rebellion in the new future, unless there is a cataclysmic event, like a large massacre of returning Tutsi refugees (which is not implausible). The CNDP was so successful because the political context was ripe: it had backing from Rwanda as well as from business interests, it had the support of some local leaders and communities, and it was able effectively to build on the fears of Congolese Tutsi. Rwanda does not appear to want a new rebellion (but they don't seem to mind the mess), many businessmen are benefitting from the current situation, and the Tutsi community is somewhat divided. 3. As for the Congolese responsibilities, I would certainly say that Kabila has less the political situation in the East fester, and that numerous local politicians seem to be stepping in to press their own agendas by backing armed groups. As for the national assembly, I don't think they really care too much about the Kivus - it's not a major electoral issue for MPs from outside of the Kivus. The governor of North Kivu is currently embattled and has never played a lead role in engaging the rebel groups (although some accuse his vice-governor of backing one of them). It's mostly Kinshasa that deals with the rebels, and even there it's only the military. There is no political process currently ongoing in the eastern Congo for the other groups, that's very important to realize. 1. Based on your knowledge and experiences, to what extent does Tutsi clan identity play a role in Congo vs. Rwanda? 2. Does Congo, like Rwanda, also have lineage identites that play a role in political and military alignments? 3. If so, to what extent do they factor in within the Congolese? 4. Is there any difference in the "weight" given on these identites in Congolese Tutsi who have spent considerable time in Rwanda (particulary those who fought with the RPA at some time between 1990-1994 and attended the RPF's political training camps, which introduced the Inkotanyi as a lineage identity to solidify their unity via a collective identity) vs. the Congolese Tutsi who aligned/fought for the CNDP but did not spend time in Rwanda and have only their various Congolese identities? Sorry to ask so many questions, but I had to ask some related potential follow-up questions. Thank you in advance for your time and any knowledge you are willing to share on these questions. Thank you also for donating time from your busy schedule to provide these timely updates on your blog. Insightful questions that I will not be able to fully respond to - clan identity amongst the Tutsi does play a difference, as does their socialization within the RPF. We currently see some divides between the Bagogwe, mostly from Masisi, and what is usually referred to as Banyanduga or Bajomba, many of whom are from Bwisha in Rutshuru. This is reinforced by a class divide - Bagogwe are often poor cattle-herders. The other Congolese don't really care too much about these difference, I think, but I could be wrong. Many other aspects play huge roles - business interests, religious affiliation (Nkunda was a prime example of this), and personal ties.